St Finnan's Bay in County Kerry is an exposed beach break that has reasonably consistent surf and can work at any time of the year. Offshore winds blow from the northeast with some shelter here from north winds. Groundswells and windswells are equally likely and the ideal swell direction is from the southwest. The beach break provides left and right handers. Best around low tide. It very rarely gets crowded here. Take care to avoid the rocks. For Ballinskelligs Bay, 10 km from St Finan's Bay. At Valentia Observator, 12 km from St Finan's Bay. At M3 Mizen Head Buoy, 49 miles from St Finan's Bay. The two graphs above are also combined in the single St Finan's Bay surf consistency graph. Also see St Finan's Bay surf quality by season and St Finan's Bay surf quality by month. Compare St Finan's Bay with another surf break. “Saint Finan's Bay is a wonderful little beach where the Kerry mountains fade into the Atlantic Ocean. At high tide, the sand here is almost entirely covered by the sea but at low tide a fair sized beach is uncovered. Quite popular in summer, but always friendly. Crystal clear water and the magnificent profile of the Skellig Islands between waves. Scenic Ireland at its very best. 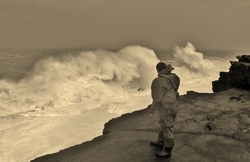 In terms of wind, waves and weather St. Finan's is an exceptionally exposed location, open to the full force of a SW gale when the surf must get immense, but also offering a wave in West or even big wrapping NW, as well as occasional south swells from Biscay lows. Also, it is located so far west that like Coomenoole, it must even be exposed to south Atlantic swells in the Irish summer, at about the 20-30cm height and 20 second or longer periods. This all goes to make this little beach very consistent in terms of surf, but very prone to being blown out and extremely prone to being cloudy and wet. A good spot to head in summer when all else if flat but in all probability, in winter it will more often be too big than too small. In the prevailing west swell conditions, expect two or three foot here when Ballinskelligs and Derrynane are just an unsurfable foot (which is why the local surf schools tend to come here in summer). Peaky lefts and especially rights are the specialty. Best at mid tide. It can be very good up to head high in light/offshore N or NE winds. The closest passenger airport to St Finan's Bay is Kerry Airport (KIR) in Ireland, 68 km (42 miles) away (directly). The second nearest airport to St Finan's Bay is Cork Airport (ORK), also in Ireland, 127 km (79 miles) away. Third is Shannon Airport (SNN) in Ireland, 136 km (84 miles) away. Galway Airport (GWY) in Ireland is 188 km (117 miles) away. Waterford Airport (WAT), also in Ireland is the fifth nearest airport to St Finan's Bay and is 226 km (140 miles) away. This is the Surf-Forecast page for St Finan's Bay, Kerry. Use the tab navigation above to view St Finan's Bay sea temperature, St Finan's Bay photographs, St Finan's Bay detailed swell predictions, wind and weather forecasts, St Finan's Bay webcams, current wind from Kerry live weather stations and St Finan's Bay tide predictions. 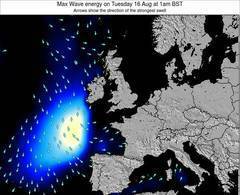 The Ireland swell maps link will open up the big picture showing Ireland and the surrounding seas. These swell maps can be animated to show the different swell components, wave energy, wave period, wave heights, together with wind and weather forecasts, current weather and sea state observations from Ireland wave-buoys, passing ships and coastal weather stations. Each of the forecast pages for this surf break feature a global and regional wavefinder tool to locate the best surf conditions in the area around St Finan's Bay.